Every month contains an action shot with head shot of famous drivers of the past. Bud was the premier photographer and you will love his black & white photos. 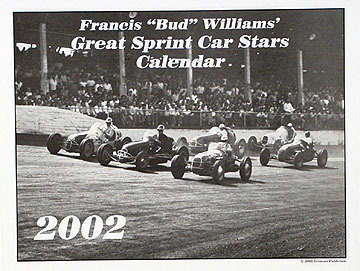 Drivers shown are Mike Nazaruk & Duane Carter, Pat O'Connor & Larry Crockett, Eddie Sachs & Don Freeland, Bob Sweikert & Bob Scott, Joe James & Paul Howe, Larry Crockett & Jimmy Daywalt, Andy Linden & Jimmy Daywalt, Ted Horn. Leroy Byers photos of Jud Larson and Jan Opperman. Rex Mays photo by Boyd Harnell. This calendar is dedicated to the memory of David Knox. David's photos of Johnny Thomson are used.